I initially scoffed at them, referring to their gladiator-sandal look. But then I got hip to the trend. Had to get me some of them way-cool shoes, to be in vogue and comfortable -- a rare combination when talking about shoes in Paris. I thus found myself today in Sylk, a boutique on rue de Rennes, where a mini-stampede was forming near the back corner of the store by the tottering stack of shoe boxes. "Wait! Attendez, mesdames, j'arrive!" shouted the saleslady at the cash register. Women were rummaging through boxes, examining the pointures and the modeles available in the must-have shoe of the summer. The energetic young saleswoman squeezed her way into the crowd. "Whom can I help first?" she smiled, a bit breathless. One by one, she asked the clients what style, color, model, size. "Une bride ou deux?" [One strap or two?] The tall woman in front of me scarfed up the very last pair of 41s -- my size. I waited in the opposite corner, surreptitiously eyeing her to see if she actually was going to buy them after trying them on. Damn. They were perfect. I left. Foiled but not stumped, I wandered down rue Saint Placide. Yippee! 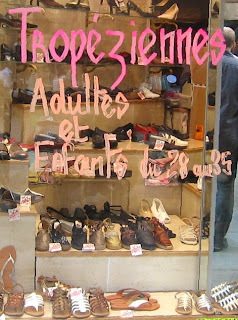 A hot-pink sign on this shoe store vitrine promising Tropeziennes aplenty inside. Onward, foot-fashion soldiers, to the next of many shoe stores on the street. Lots of les Tropeziennes -- whew! Tan, gold, silver, black, white, or faux snakeskin -- the top-sellers. I scored a pair: 39€. Genuine leather. 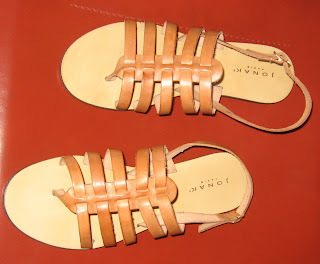 Bee had just bought the same pair at Jonak, this boutique, yesterday. Tropeziennnes. They are everywhere! The mad rush before August vacation is making them hot-hot-hot. 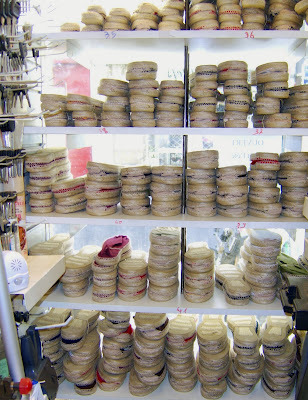 "So," I asked the salesclerk at Jonak semi-innocently, "are you selling a lot of Tropeziennes lately?" "Ah oui!" she enthused. "Beaucoup beaucoup. You could say it is THE shoe of the summer." I just love asking those rhetorical questions. Sundays with Richard and Polly -- and Bee! Normally I find Paris to be a sight for sore eyes. The subtle, muted tones of the architecture, the verdant gardens, the gilded grandeur of interiors. After Sunday's expedition, however, my retinas may have to go on August vacation. 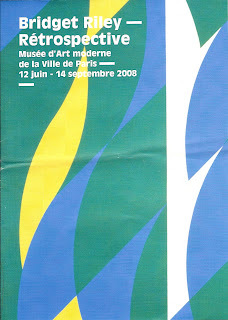 For this month's Sundays with Richard and Polly, our indoor venue du jour was the fabulous Bridget Riley Retrospective at the Musee d'Art Moderne at the Palais de Toyko. 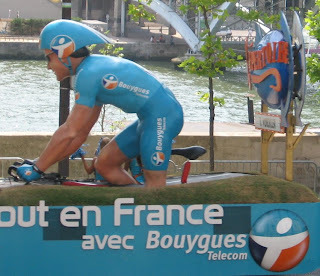 This turned out to be a perfect setting, because Bee wanted to see both the exhibit and the finale of the Tour de France. So she and I met up with Richard at the museum and we planned to view the arrival of the cyclists after lunch. But first, the Bridget Riley Retrospective. Please go see this exhibit. My first reaction was how well it was curated. Starting with her early works showing her interest in pointillism and Seurat, the exhibit quickly tosses the viewer into her 1950s-1960s work. "Ooh, op-art!" you'll say when you see it, which may be partially correct, although Riley herself eschews that popular reference to her art. If you view it as a modern impressionism, you'll have a clearer sense of her artistic purpose. But the optical effect of this exhibit will change you. This is the most visual visual art. I am not one who is usually at a loss for words, but it left me speechless. The only words I could find were, "I wonder if her work was planned to be viewed all at once?" because after a while I had to close my eyes in between paintings just to give the optical nerves a rest. If you asked me to, I could go into long-winded explanations of the immediate visual connection I had to the work of Vasarely, whose chateau museum at Gordes so influenced my nascent perception of Art when I visited it in 1975. And it turns out that Vasarely was an important influence on Riley. But I can't describe all that here. If you don't already know Riley's work, your eyes and your perception of art will never be the same. Then we had lunch on the terrace outside the museum, then as we heard loudspeakers blaring by on the road below, we knew it was time to check out the imminent arrival of the Tour de France -- or so we thought. 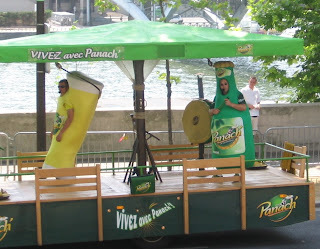 It wasn't the real cyclists arriving, but the floats of the sponsors of the event. Wow -- more bright colors and vivid visuals in an otherwise stately Paris! 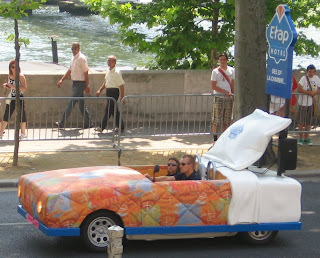 and -- my personal favorite -- a travelling bed with a couple inside, advertising a hotel. 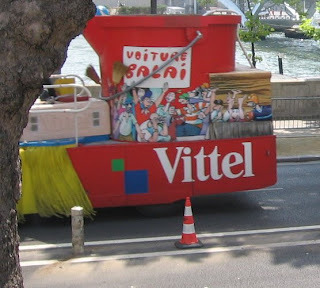 I liked the last float representing the "voiture balai," complete with brooms. 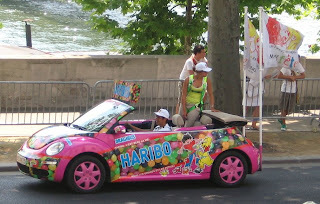 The real voiture balai is the car that picks up riders who can't continue on the race. Then silently speeding by were all the press cars, many with journalists in the back seat madly tapping away on their laptops. Then VIP buses. Then nothing. It appeared that a long wait stretched ahead until the leaders of the pack would appear. Richard and I, being of the -- ahem -- older generation, decided to call it quits and split before the cyclists arrived. It was hot and we'd been standing for a long while. Sore feet. We left Bee and her friend to watch the cyclists' arrival. I bid Richard adieu and returned home to watch the end of the race on TV, feet up. Eyes sometimes closed. But Bee got some fun footage from this vantage point of the cyclists just before they reached their final laps around the Champs Elysees. And now check out what Richard had to say about our day. Ever since I was a teen-aged Francophile, I've loved the look and comfort of this classic Basque footwear. In the folly of youth, in a vain attempt to prolong the joy of my infrequent sojourns in France, I was known to wear espadrilles in the heart of New England winters. When there wasn't any slush afoot, of course. Although these traditional rope-soled shoes are mostly vacation attire, they can be seen occasionally on some of the best feet in Paris. I'm no style maven, but I have noticed an uptick in espadrille-spottings in the city. And some of the wedge-heeled espadrilles are 100% tendance for the summer months. 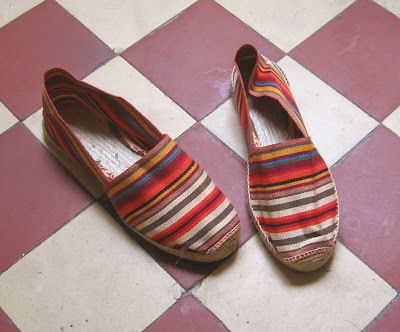 A few tips for old-fashioned espadrilles: they are normally a bit tight when you buy them, and will stretch out slightly with wear, until you get them wet (not recommended). Also, there is no left or right shoe: they adapt to your foot as you wear them, which is in part why they are so comfortable. But where to buy espadrilles in Paris? They're not so easy to track down, and are rarely found in any of the thousands of "regular" shoe stores. Fortunately, a cobbler on rue du Temple has the classic, flat hand-sewn espadrilles in a variety of colors and some great stripes for €13 a pair. Leather espadrilles for €30. 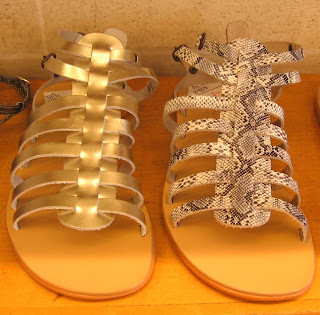 and a variety of wedge-heeled sandals. All made in Spain. 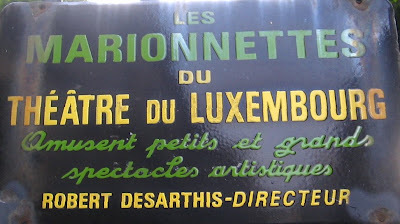 Being a traditional cordonnerie, the shop also makes plaques, rubber stamps, and keys. Open Tuesday through Saturday. If you're looking for a Made-in-France espadrille, check out the website of Paré Gabia. It features espadrilles still made in the Basque region, combining tradition with innovation. When I spotted this window display at Loft Design By on rue de Rennes, my mind went into a wee bit of a tailspin. Chic grey sweatpants. 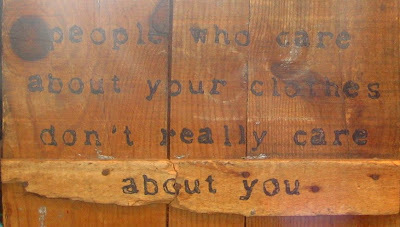 A tee-shirt and other signage touting "people who care about your clothes don't really care about you." Um, hold on a sec. This is Paris, right? Was it all in English for the benefit of the Tourists of August? 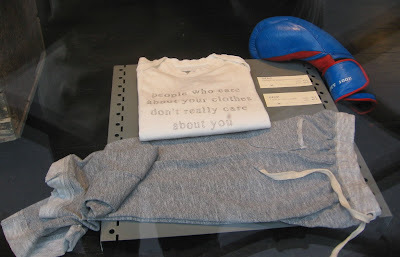 Does it represent a new trend in fashion consciousness in Paris, a sartorial je m'en-foutisme? Or (think about it) does it simply reflect the status quo? Labels: fashion, shopping, where am I? I was the only American at a casual and lively Parisian dinner party last night. Of course I was making my habitual language gaffes, but more or less feeling content that I was keeping up with and participating in the conversation: events, politics, gossip, lifestyle, cuisine, vacations, French education -- the gamut. Dinnertime talk was animated and impassioned. At one point somehow we were talking about hats. Then other fashion accessories: gloves. Les gants. Please note: this was not chick-talk. The men were equally engaged in the conversation. Next came searching discussion of where there are still gantiers in Paris (too few!) and about the fact that gloves aren't much in evidence these days. One handsome brown-eyed guest in his early 40s proclaimed, "It's such a pity that gloves aren't worn more. I think that gloves -- the sleek, elegant kind -- on a woman are the sexiest thing in the world." The rest of the men at the table erupted in thunderous approval, exclamations, and recommendations. Now that it's really summer, when getting around on foot I switch from my habit of walking on the sunny side of the street, and instead always seek a shady route. 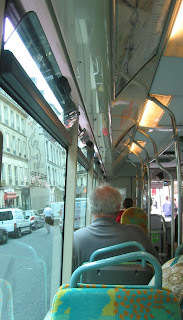 In the warm weather, riding on the bus can offer a bit of relief from the heat of the sidewalks. When waiting for the bus, if the sun is really pelting down, I sometimes stand in the tiny patch of shadow cast by the bus stop sign. On board, the narrow vents at the top of the windows offer the only breeze unless you stand by the middle doors and wait for them to open. I immediately flip open a vent if possible. I love the rules posted about windows. Do not let your arm hang outside the window. A moot point, unless you happen to resemble Mr. Tickle. You may open or close the windows according to your desire. In case of disagreement among the passengers, priority is given to whoever wants to close the window. Today's excursion: the Porte de Champerret. When the bus reaches the end of the line, the announcement says, "Terminus. All passengers are invited to get off." It sounds so polite. If you wander around any neighborhood in Paris, you're bound to come across a detail, a place, a person, or an activity that catches your eye. 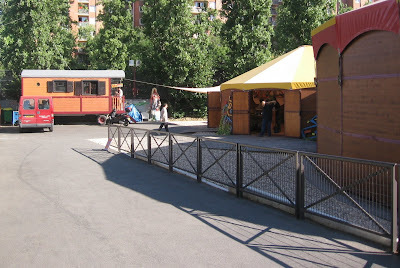 Today in the 17e arrondissement I stumbled upon what appeared to be circus tents and gypsy caravans. Curiosity is my middle name, so I circled around a bit and observed. Inside the fence enclosure were happy people laughing and greeting each other. There seemed to be a lot of positive energy. It didn't look like the stereotypical carnival circus. Something vibrant and joyful. The sign read "Chapiteaux Turbulents!" Chapiteau means big-top or circus tent. A few people were hanging out at the entrance gate, so I stopped to ask a woman what this was. "We welcome les jeunes handicapés and teach them les arts du spectacle, performing arts," she explained. She kindly allowed me to take a photo or two from the entrance. I turned to leave and these two jolly guys stood in my path and mugged for a photo. "Great! " I laughed. "Merci! 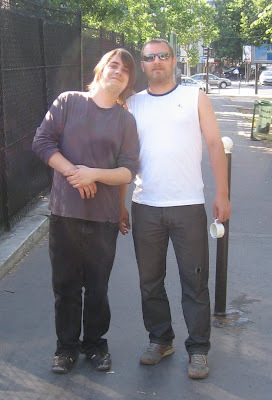 It will be in my blog, and your handsome faces will be seen across the internet." "What's the name of le site?" one asked. "Polly-Vous Français." I spelled, pay-oh-deuzell-eegrek. "Oh, so you speak English?" he immediately switched to English. It turns out that Chapiteaux Turbulents! is not just any clown school. It offers multidsicplinary performing arts workshops for youths and adults with autism or communications disorders. The Turbulence! association was founded fifteen years ago by French actor Philippe Duban and Howard Buten, an American in Paris who is a writer, psychologist -- and well known as Buffo the clown. The Turbulents' first public performance was in May 2007. I look forward to the next one. Watch a silent video of the building of the big top. 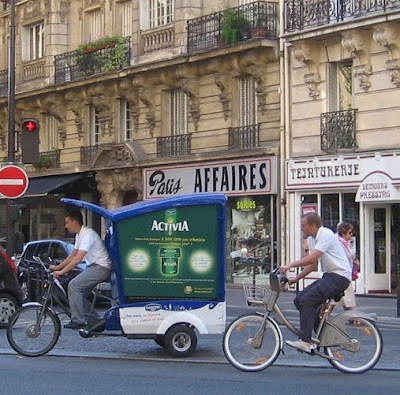 This fellow was pedalling around the 17e arrondissement today, advertising Activia yogurt. Hmm. I wonder if Jamie Lee Curtis was riding in the back? Or even better, the group from Saturday Night Live? I just love your product! After two years in Paris, I still get caught by surprise by the proximity of otherwise familiar places and street intersections. I think I know where I am, but really I don't have the bigger picture. 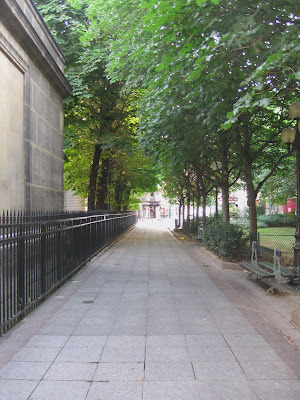 For example, I'll be strolling around St. Sulpice and take a wrong turn. "Whoa, you mean St. Sulpice is right next door to the Jardin du Luxembourg?" It never fails to blow me away. This happens to me over and over: different pieces of the Parisian jigsaw puzzle getting pressed into place bit by bit, finally etched into spatial memory. One street that keeps bedevilling my directionally-challenged brain, as it crosses my path in the most unexpected (to me) places, is rue d'Assas. One minute I'll be minding my own beeswax, walking or taking the bus, and next thing I know, there pops up an intersection with rue d'Assas again. 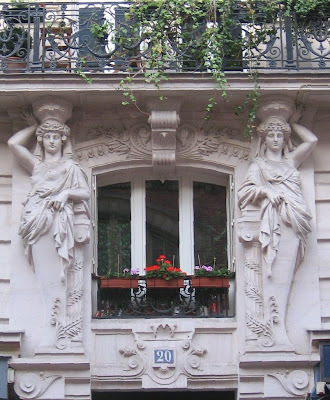 First, I admired two pairs of caryatids. It was so early that the early morning joggers were running outside the Jardin du Luxembourg, which hadn't opened its gates. I've seen lots of Guignol shows in parks in Paris, but no Marionnettes. Must return! By the way, if you hear a French person saying he or she is studying at Assas (pronounced ah-sahss), it refers to this. I wandered down the courtyard of the Musée Zadkine, which was not yet open. Of course, it was only 7 a.m., so I forgive them. I'll be back for a visit there post-haste. Artist and sculptor Ossip Zadkine called his atelier his "petite folie d'Assas." The Botanical Gardens of the Université de Paris looked enticing. I'll have to find out if they're open to the public. 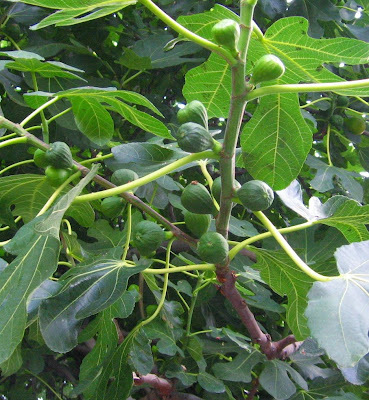 At the far end I found what I believe to be the largest supply of fig leaves in Paris, an immense and ancient figuier. 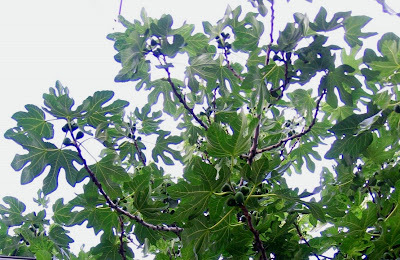 If I can fig-ure out when the fruit will be perfectly ripe, I'd love to sneak by and pluck a few from the low-hanging branches. 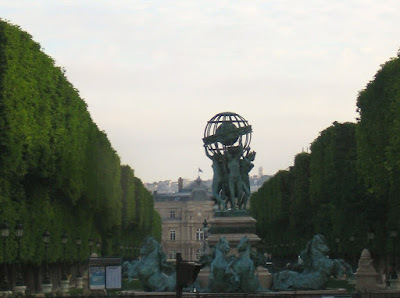 Of course, there is little or no use for the fig leaves on statues in Paris! When you reach the top of rue d'Assas, there is a great view across Paris. You can see past the Senate, and Montmartre on the distant hilltop. This was the most animated face I'd seen all morning. 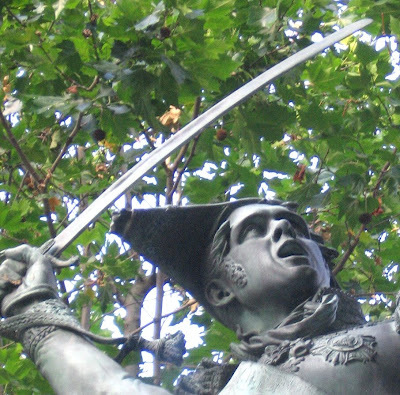 Le Maréchal de Ney. 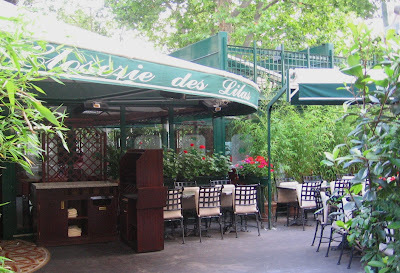 The Closerie des Lilas was quiet. Closed. 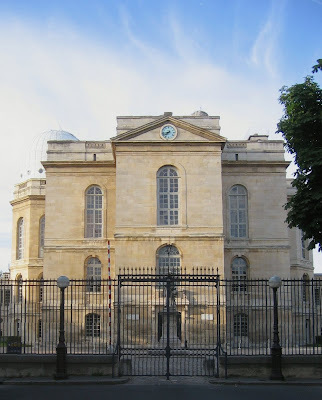 The Observatoire de Paris was at the top. It's open to the public only once a month, by reservation. On my meandering trip home, I discovered the Val-de-Grace Hospital in the 5e arrondissement. How could I have never seen this before? Bee and I had a hankering to get out of town for a spell. Bless that girl, she has inherited my love of tootling around the French countryside. So I rented a car, we assembled maps, and headed south from Paris for an overnight road trip. Her job was to navigate, and in short order she learned that getting where you're going in France is not the same as in the US, especially if you're travelling only on the backroads, the routes départementales. Knowing la direction means not the compass direction or the road name, but the next town that you're heading for. She is now a crackerjack co-pilot and maneuvered us through golden wheatfields, past troglodyte houses, and found clever shortcuts through a few zones industrielles to keep us from the traffic fray in smaller cities. 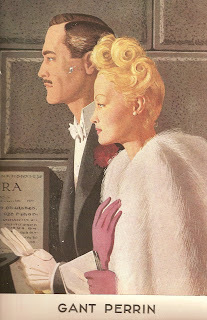 Favoring spontaneity and serendipity, by early evening we still hadn't made reservations for the night's lodging. 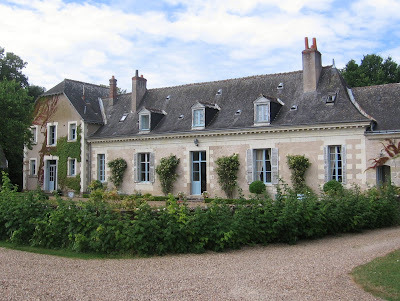 We parked in the shade in Vouvray and I called a few numbers of B&Bs I had scribbled down hastily prior to departure, after having googled the keywords hotels - charme - vouvray. The first place, in Amboise, was full. Second number, bingo! They had a suite with a little kitchenette available for one night. Sounded perfect. It was on the other side of Tours, about half an hour away. 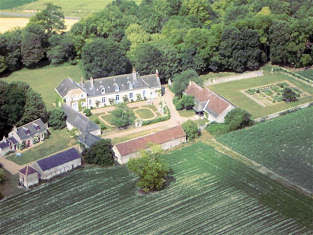 Getting there, on a périphérique north of Tours, we began having second thoughts. The area was looking very industrial, not exactly the French countryside we had hoped for. Then as if by magic, the tacky commercial road simply vanished and we were again in the middle of serene fields and small villages. We found the quaint village of Mettray, and the tree-lined driveway to La Cornillière. We instantly cooed with awe and delight as we drove through the stone gates. There could be no more ideal spot for us than this! A compound of ancient stone buildings, perfectly restored with just the right feel, the right patina. The jovial host greeted us and gave us a tour of the grounds while his wife finished preparing the rooms. The fields, the paths in the fragrant woods, his potager. The yet-to-be-renovated dependencies, a pigeonnier, and a rustic barn. We were in heaven. 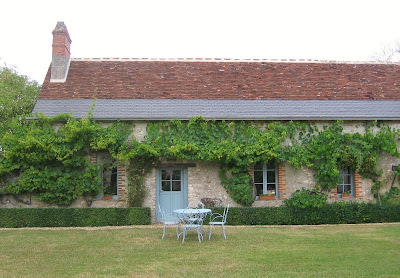 Our cottage was sublime and simple, with antique tile floors and panels of Toile de Jouy on the walls. Comme il faut, not over-the-top. The entire place was authentic and charming; we knew already that we would want to return to La Cornillière when we had more time to spend. Making the usual small talk, the owner asked where we were from. "Ah, oui, the East Coast of the US?" he said. "Yes, I go there often. In fact, we are spending two weeks in August in Maine," he continued, naming a small remote island. My jaw dropped. "You -- are -- Didier!" I gasped. "I don't believe it." His jaw dropped. "Vous êtes la soeur de Mag!" Eight years ago, he and I had met for about 10 minutes, right on this porch, one sunny afternoon, when he stopped by with his island hostess, my sister's best friend. I will believe in the Fates, kismet, and the gods of serendipity for the rest of my life. Bee and I are riding the 92 bus down avenue Bosquet. "My Husband Thinks I'm French." It was an unexpectedly great July 14th for me in Paris. 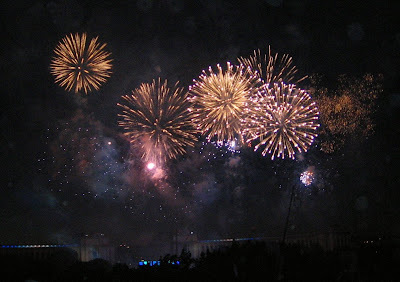 Fireworks over the Trocadero were sublime. Update: I took these photos from an incredible top-floor apartment balcony here. I hope I get invited back next year! Getting there and back was another story. In Paris, sometimes it seems that the party -- or some part of the party -- is in the street. Yesterday evening Miss Bee and I trotted over to the Caserne St. Sulpice on rue du Vieux Colombier for the Bastille Day bal populaire offered by the Sapeurs-Pompiers de Paris. I had been advised by two handsome firemen earlier in the week not to arrive too late. So, let's see -- about 9:30? -- I figured. We didn't want to appear too desperate and be the first belles at the ball on the stroke of nine. Oops. When Bee and I arrived at 9:30, the line was already wrapped around the block like this. We shrugged and figured we'd get in soon enough, and began our wait with the rest of the crowd. She was texting her college friends who were at Chatelet, giving instructions how to find us. While she held our place in line, I snuck around the back to check out the party action at the actual entrance. The loudspeakers were blaring Rod Stewart's "The Year of the Cat." The lights were twinkling in the dusk as earlybirds mingled in the courtyard. Partygoers squeezing in at the gate were directed to a big plastic bin to deposit any monetary contribution to the fete. From my spying, it seemed that donations ran the gamut: some people were pretending to put a coin in the slot, and yet I saw others pop in a 10€ bill. 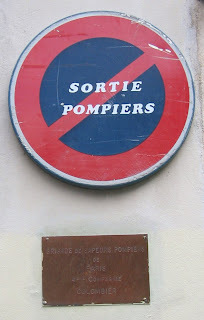 The young pompiers, bursting out of their polo shirts, jazzing around at their tasks, were clearly in their element. The air was charged with anticipation. At the bar in the corner, the sign read "Champagne à la coupe 6€." Another oops. I knew I'd have to report back to Bee, since she'd been banking on free champagne. I joined her back in the line, pleased that we'd made decent forward progress. It was mostly a fun and boisterous younger-than-me crowd, and they were coming and going from their outposts to get take-out beer (at usurious prices) from nearby bars, for quenching thirsts during the wait. As people walked by viewing the line, here's what we heard. As we rounded the corner on rue du Vieux Colombier this lout and his date arrived out of nowhere and brazenly slipped into the line in front of the group immediately in front of us. I was annoyed that no one protested. So I made a few loud comments to Bee, like, "When you're 6'3" and wearing a bright white shirt, you really stand out and it's soooo obvious when you are an obnoxious line-jumper." I repeated it in French for good measure. Of course, when you are 6'3" and beefy like him, probably no one is going to mess with you when you are an expresshole line-jumper. 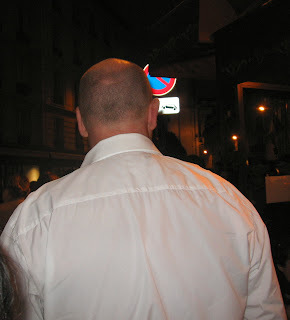 But I thought I'd wreak my pathetic vengeance by posting a photo of his back on my blog. Finally Bee's friends arrived. After chatting with them for a spell it was after 11 pm with at least another half hour before any hope of getting into the party (we'd reached the second line on the photo above). So I decided to call it an evening. I'd had plenty of crowd-entertainment for one night. It was chilly, and my cramped toes were beginning to ache in my pointy party shoes. Besides, to be honest it was more their crowd than mine, and so I opted to be a sensible Cendrillon and leave the ball before midnight. I escaped the hubbub and strolled happily home in the dark of Paris, clasping my cardigan gently at my collarbone to ward off the chill of the evening air. Rue de Babylone was still and peaceful. I looked up between the streetlamps and gasped: the expanse of western sky, a deep sapphire blue, was decorated with dense, flat clouds painted in rust and salmon. A bright half moon hung to the south. I stepped slowly along the silent sidewalk, gawking at the unexpected poetry of the night. At the back entrance to the gardens of the Hotel Matignon, a solitary policeman on guard quietly greeted me. "Bonsoir." A well-aged, gravelly voice. "On vous entend de loin." I heard your footsteps from far away, he said. "Ah, oui." I paused, and nodded at my shoes. "You were looking up at something?" he asked. "Oh, the sky," I exclaimed. "Did you see? The clouds and the sky! 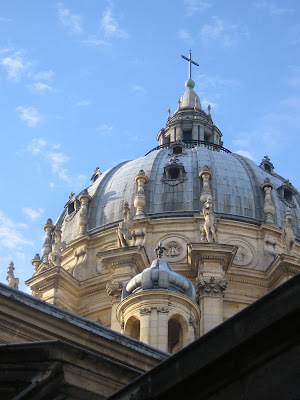 It's so..."
"Oui, c'est beau, Paris," said my officer, glancing skyward, then back down. "Yes, it is. So beautiful." A pause. A returned smile. A pause. "Well, bonne soirée," I offered as I continued on. "Be careful," he cautioned gently. "Oh... merci. J'habite tout près. Au revoir." How complicated could it be to fix a tiny leak, you ask? On Tuesday morning the apartment doorbell rang without warning, and it was the gardienne and a plumber. I guess it was the plumber I had waited for all afternoon the day before, because water was dripping into my downstairs neighbor's apartment from somewhere. Fortunately I was dressed and out of my pajamas, and no lingerie was embarrassingly strewn on the bathroom floor. In they trooped, and I showed him the access to the pipes under the tub. He shined his flashlight under the bathtub, under the sink, and pronounced, "I don't see much of a leak -- but there is some moisture under the sink. It must be the weak soudure from the old lead pipes." He jotted down a few notes and departed. Right-o. So I figured the downstairs neighbor would take care of whatever needed to be done and they'd let me know when the plumber would be back to repair the soldered joint. Case closed. How naive of me to think it could be so simple. Friday morning my cell phone rang. Get this: it was the real estate company who rented me the apartment two years ago. "We received a fax from your neighbor saying there is an ongoing leak from your apartment and you better do something about it NOW." Fortunately, I have developed nerves of Teflon -- and enough deflecting French lingo -- to fend off this type of supposed threat. Actually, I've figured out that it's just a game of Chicken, a particular way of life here sometimes when dealing with community or shared problems. The former American Pollyanna version of me would have wrung her hands in despair, secretly concluding that I was somehow at fault, wailing "it's not fair!" and wishing the Others would be more understanding, and a tad more helpful to a relative newcomer who might not understand the system. Nevermore. In essence, I have learned to say "Eet ees nowt my dahwg." "Je suis désolée, monsieur. But the plumber was already here." Blah blah, blah, I explained, calmly but firmly reporting the plumber's diagnosis. "Non-non-non-non," insisted Monsieur Real Estate. "The neighbor insists that it is still très urgent -- un grand problème -- and you had better contact your insurance company right away." Sheesh. Whose side was he on, anyway? Hadn't I paid him a hefty commission when he found the apartment for me? I was baffled but unruffled. Again (I'm so pleased with myself!) I maintained, "Problems with plumbing which have nothing to do with my inhabiting this space are not mine to deal with. It is the fault of whoever installed the plumbing years ago, the syndic [building association] or my landlord, but not me. And the plumber confirmed that it was not due to my use of the plumbing or my negligence in any way." I like to pepper my sentences with the word constater because it makes me sound like I know what I'm saying. "Urrhargrumpfhhh," quoth he, "Mais, nous avons reçu un fax. Et, et, et... enfin, what do plumbers know? They'll say anything. They're liars and the scum of the earth, you know." "Sorry, monsieur, it wasn't MY plumber. He's the expert, and seemed to know what he was talking about." "Well, something needs to be done right away." "Bon courage," I said matter-of-factly. Half an hour later, the cell phone rang again. "Allo madame? this is the Cabinet H. You know, Cabinet H, we are your apartment management company." "Oui monsieur, bien sur. I certainly recognize your name, as you extract a sizable chunk from my bank account each month and send me a quittance de loyer on that flimsy paper." Duh. "Alors, madame, we have received a fax from the Agence Immobilier who received a fax from the downstairs neighbor saying that your apartment has a fuite and it is constantly damaging the ceiling in the apartment below." How many times were various parties going to try to grind me down on this? I was actually kind of enjoying this game, knowing that they couldn't pull one over on me. The cell phone rang two hours later. "Alloa madama? Je suia le polombiah..." A new plumber, who sounded as if he were calling from the bottom of a cistern. "J'ai-ah reçu una fax dua Cabinetta H quia a reçu una fax de l'agenta immobilier qui a reçu una fax de votra voisine," he began. With malicious glee I tried to envision the fourth-generation fax -- surely illegible at this point. Too bad I don't have a fax machine. I could ask them to fax it to me, too, just for fun and games. I leaned back in my chair and began the conversation anew, with slow-downs and repetitions. Sure. Come check out the "leak." Oh, you can't come until after the long weekend? A shame, I may be away in the US next week, I said, and I won't know until the end of the day. An hour later, the cell phone rang again. It was the plumber. "Alloa madama? J'arriva tout de suite." Maybe there are some sleazeball plumbers around, but so far I've had only nice encounters with them. I like anyone who understands plumbing more than I do. This friendly guy was Ace Detective, and wanted to see every inch of pipes. He showed me where the pipes had been improperly installed so they have to try to defeat the laws of gravity by draining on an upward slant. "Would that be why there were always foul odors emanating from the bathtub drain?" I asked sweetly. He nodded in earnest. "Oui, this is all a mess," he concluded. "Where it was installed at the proper angles, the PVC and the old lead pipes just don't join properly." The good news: he re-caulked my tub and wrote up the devis [estimate] for the syndic -- not for me -- for the work to be done. The bad news: les travaux -- the necessary repairs -- are the whole enchilada. Ripping out the wall, replacing all the bathroom plumbing including the john, and all the pipes under the kitchen sink. It should take "3 or 4 days." Stay tuned as I warm up for my next Battle Hymn: who pays for me to live somewhere else when I have no place to pee for four days? Marcel has a mustache and wears a beret. 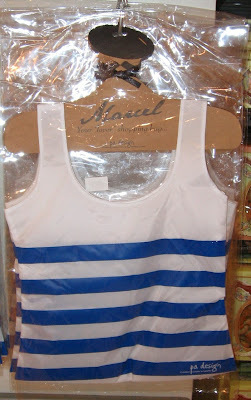 Marcel sports a blue-and white débardeur and a neck kerchief. Marcel is ... your French Lover? Actually, Marcel is a clever reusable nylon shopping bag that I spotted today at La Grande Epicerie at Le Bon Marché. At €15, Marcel may be a bargain lover, but he's an expensive grocery bag. Today’s morning walk. Um. Let me begin at the beginning. Meandering through side streets near the Jardin du Luxembourg, I came upon rue Marie Pape Carpantier. 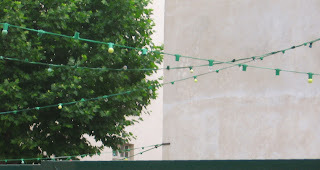 Over a wall, I saw bright strings of lights festooning a closed courtyard. “Must be leftover decorations from one of those school Fêtes de fin d’année,” I thought. Then I spotted the sign on the wall. Sortie Pompiers. Aha! This was preparation for the public Bastille Day parties hosted by the Parisian hosts with the most, the Sapeurs-Pompiers de Paris. The caserne is a large building, so I decided to circumnavigate the block to locate the entrance and see if there was any info about the upcoming Bastille Day bash. 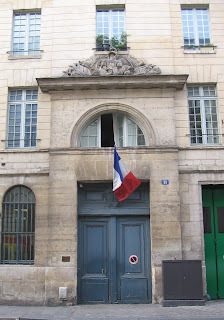 I found the entrance at 11 rue du Vieux Colombier. The public announcement board had plenty of information about Pompier events. Rats! 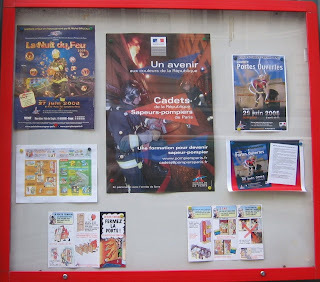 I’d missed the Portes Ouvertes, the Fireman’s public open house, a week ago. And no announcements about le quatorze juillet. Then. Oh my. As I was perusing the tableau d’affichage, a voice perked up behind me. 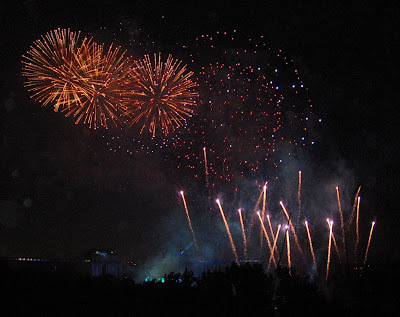 “N’oubliez pas la fête du 14 juillet.” I spun around and there were two gorgeous young firemen in their spandex running outfits, apparently embarking on their morning exercise. They were so adorable that I got a bit flustered. “Oui, en effet, I was just looking for information about the fourteenth.” Forget the fact that I am old enough to be their – aunt. I can appreciate male charms and attractiveness at any age. I sure know which bal populaire I'll be attending on July 14th. And there are many more throughout the city. Maybe most Parisiennes are fretting over the latest 2008 glam styles of bathing suits, and how to carve off an extra milligram of imagined fat, in time for les vacances. Just wear one of these babies at la piscine or la plage and no one will look at your hips. Vintage bathing caps at Shadé, 63 rue des Saints-Pères in the 6e arrondissement. Some days -- most days -- you just want to be in Paris. Oh, Paris! Paris is so very Paris. Some days you want to be somewhere else. Some days you want to be somewhere that is Not Paris because you want to be with someone dear to you who is far away, or some days it's because you want to be sitting your very own private garden, or relaxing some place that is just peaceful, or some days you just want to be Not In Paris. Some days it's when the downstairs neighbor calls to say that your pipes are leaking on her bathroom ceiling because she claims there is a canalisation in your pipes and you wait five hours for her plumber who doesn't arrive, and then you realize the true meaning of canalisation when you are standing ankle-deep in backed-up really ugly water in the shower. Some days it's when the only functioning light in the bathroom burns out and the other halogen light socket got its electrical cord snipped by a well-intentioned "helper," so if you don't find an expensive electrician in before nightfall it will be dark in the bathroom which is a very bad thing when there are embarrassing bottles of all colors and sizes cluttering the sink all of which will knock over because there isn't enough storage room in the damned apartment and it is too depressing to think of running an extension cord and spare lamp into the salle de bains. Some days it's when your wireless internet connection has not been working for a week and you've played talkie-talkie-kissy-face with France Telecom who promises the world and delivers nothing and your sweet daughter who is as internet-addicted as you sits on the couch waiting for you to hand her the ethernet cord for her turn on line and you wouldn't trade having her here with you in Paris for anything but you can't really write or update your blog or run a home office or accomplish anything else that grown-ups have to accomplish while sitting cozily on the jumbled pull-out sofa with her which is where the mangled ethernet cord lives. Some days it's when you are going nuts having to stand next to the ancient moldy washing machine in the kitchen to turn the knob from one cycle to the next for all five cycles because it's too decrepit to take that simple step on its own and you know you should buy a new washing machine but it's such a bother and expense and when this incompetent machine finally does finish the umpteenth load of laundry and the clothes are soaking wet instead of wrung almost dry and it will take years for them to air dry because it's cold and raining out side even though it's July. Some days it's when you need to get errands done but like I said it's cold and raining and the thought of trudging to the Tresor Public to go over the dossier with the gentle kind gray man who methodically explained about the components of your taxe d'habitation in February and who very nicely sent you an abatement check after you paid the tax bill and sent him a copy of your lease and every official piece of imaginable paperwork and then three months later the Tresor sent you a bill for the same amount and you have to gather all the files again and the wind is blowing and the rain is spitting and you just want them to have figured it out correctly in the first place but oh well this is France. Some days it's just like that. But when Some Days arrive all on the Same Day -- well, it's time to call in the troops. My morning walks in Paris are precious. I kick myself when I’ve been a slug-a-bed and don’t get up and out early enough to catch the pulse of the city before the morning frenzy begins. Sundays, however, it’s pretty easy to beat the crowd. Just me and the street-cleaners, and a few Police guarding the Hotel Matignon or Quai Voltaire. Every day I venture out on foot, without a specific route. The only self-imposed rule is that I can’t copy an itinerary I’ve taken before. Early this morning on rue de Bourgogne. My heart swells: a newlyweds’ decorated car. 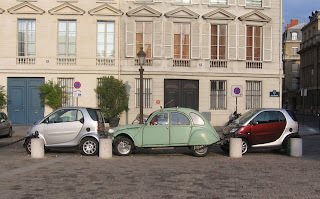 I have to admit that I find this French tradition more attractive than the scrawled “Just Married” signs affixed to bridal vehicles in the US (complete with tin cans or accompanying pranks). To me this elegant French decoration of a car means that a wedding is poignant, not jokeworthy. My former neighbors on the place de la Madeleine kept the white-netting ribbons on their car for months after the wedding ceremony. It seemed that they were proud to demonstrate their newly-married status. I wonder if there is a tradition that determines the length of time to keep the car beribboned. Next. The place du Palais Bourbon, behind the Assemblee Nationale, is so evocative. It is one of those “looks like a potential movie set” squares. This incongruous trio of cars was especially appealing. “Please do not remove before July 7. Thank you! Maybe I’ll stop by there tomorrow to witness the combat, whatever it is. I finally am on the home stretch. On Sundays most of the newsstands in the quartier are closed, but an older lady sets up a folding card table in a sunny nook of a café on rue de Sevres and sells the Sunday papers. 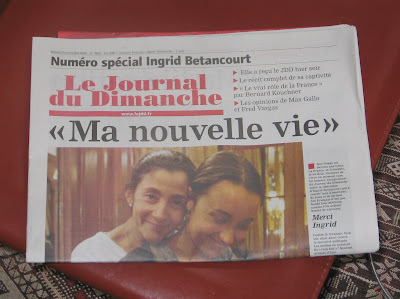 I still miss the Sunday New York Times, but have found the acceptable substitute in Paris, Le Journal du Dimanche. I step up and ask like a true Parisian, “Bonjour, madame. Le JDD, s’il vous plait.” We always make small talk about the Sunday weather. "Un euro cinquante." I tuck le gee-day-day under my arm, and round the corner for home. 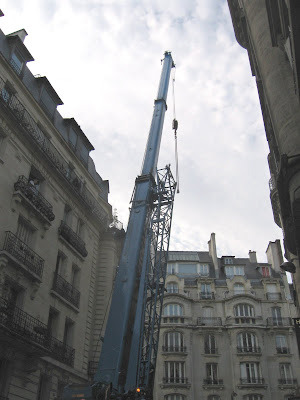 The narrow street is blocked with big machinery. 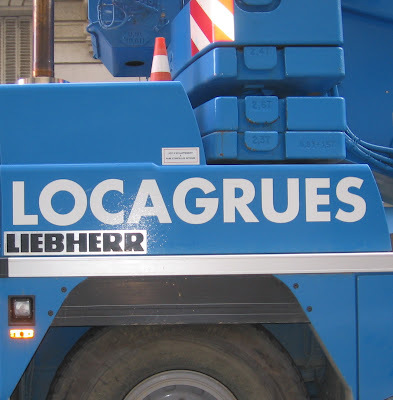 Locagrue – rent-a-crane. Someone is installing double-glazed windows, and is allowed to block all traffic for the morning to do so. Back home to delve into the paper and deal with (or perhaps ignore) lingering internet issues. It's Sunday, why not?